We are blessed with this property as we are detached have a large private balcony facing south east, enabling us to make the most of the sun even in the winter months. At night you can sit on the balcony and watch the twinkling lights along the playa whilst sipping your glass of vino.The community pool is also just outside our own private gate,and under the lounge window which is on the same level. The property is also only 5min away from your nearest supermarket, restaurants, bars, the promenade and of course the beach. Internally there is a twin-bedded room with a large wardrobe chest of drawers and bedside lamp. Main bedroom king sized bed, wardrobe,two bedside cabinets and reading lamps,with spectacular views over the playa. Lounge dining area has large corner settee, mini music centre with radio and CD player, there are a few CD for your use, TV with Freeview, catch your favourite English programmes. A DVD player. Maps and guide books. Kitchen, washing machine, fridge,hob, oven. Eating and Drinking: Eating and Drinking; A wonderful experience is to be had trying Mojacar and surrounding area`s cuisine with so many varying restaurants,there is literally something for everyones taste.You`ll find Spanish[of course], Italian, Argentinian, Chinese, Thai/Japanese, French, Indian, English, Belgian. All reasonably priced. Dining out in the Pueblo [Village] of Mojacar creates a special atmosphere,with its quaintness and charm,it seems magical.Just call for an early evening drink and take in the view. Of course there are many restaurants and beach bars along the playa,one or two with entertainment [singers, karaoke], many within walking distance of our property.You will feel quite safe taking an early or late evening stroll along the promenade. Sightseeing: If sightseeing is your thing,it is possible to visit Granada,spectacular scenery on route ,where the famous Alhambra Palace is a must,surrounded by caves which are inhabited to this day,although it is a long day taking 2 or 3hours to get there.The city of Almeria,which is on the coast is about an hour away, and has large shopping complexes on the outskirts.A must is to take the drive over the mountain to Carbonares,through the Cabo de Gata,another scenic experience,before dropping down to their beautiful sandy beach,with its beach side restaurants.Go on their market day,its bustling,and its only 20minutes away. The hanging town of Sorbas,where the houses are built on the side of the cliff over looking a ravine is also something to see and a place where you will buy the most beautiful handmade pottery. Bedar is the name of another very tiny mountain top village,famous for its panoramic views,and to dine in its restaurant is amazing. Entertaiment: An hours drive away a good day out is to be had by visiting Mini Hollywood,which is set in the desert of Tabernas and where a lot of the Spaghetti Westerns were filmed ,not to mention numerous other movies.You can wander around the authentic wild west town,where behind the facades you will find the museum that houses the original camara`s used for filming.Witness a shoot out with Jesse James and his brothers.Not to be missed the Can Can in the Yellow Rose of Texas saloon.Also within the park is a very extensive Zoo where the animals have large compounds,and takes a good walk about,although there is a little train to jump on and off for the weary.Taking a cool dip in the on site pool afterwards is most welcome before heading home.To be recommended take plenty of water as you are in the hottest part of Spain, in fact take a picnic as catering facilities are poor. A visit to the Water Park at nearby Vera, is a fun day out for the children. My husband and i fell in love with Mojacar way back in the 1980's, so when we got the opportunity to buy a holiday home where else but the still unspoilt area of Mojacar. We are now in our 70's and luckily enjoy good health, so hopefully we will continue to enjoy our holidays here. Because of its amazing views and location. Being only 5 minutes away from the seafront and a good choice of restaurants. There are no high rise Hotels or apartments in this unique corner of Spain, just a lovely olde worlde village, with cobbled streets, dating back to the 12th century. Miles of unspoilt beaches, with the sea like a warm bath in the summer months. All year round sunshine, being the hottest and driest part of Spain. Temperatures in January, warmer than a summers day in England, wonderful to escape the British winter. All bath and hand towels are provided and kept in the wardrobe of bedroom 2. The window in the bathroom is best kept open whilst taking a shower as it gets rid of the steam..You will notice the Mosquito net,so its fine to leave that window open at night. All British channels plus all radio through the T. V.
We have several accessible golf courses, nearby. Sun beds supplied around the pool, on a first come first served basis. Your beds will be made on your arrival and a change of bedding only done once a week as will the cleaning of the property,which will be down to Alison or Aly as she likes to be called, you will see Alison probably quite a bit as she helps a lot with the looking after of the community gardens also.Feel certain that if you were to have any queries at all she would be happy to help. Although we do not want people to smoke inside the property we are quite happy with them smoking out on the balcony and one or two ashtrays are to be found in the lounge.Beach Towels we are sorry to say will no longer be provided, due to the fact that all but 2 went missing last summer. It was a service we were happy to provide, as we thought it would save on the weight restriction in peoples cases, but alas it is no more. This a really lovely apartment with a pool right outside the gate and fantastic views of the sea and mountains, really makes you feel relaxed. So pleased that you enjoyed your stay and appreciated the Wonderful views we do have from the Balcony, it`s the very reason we bought the Property. Never tire of them. Nice to get a review thank you for taking the time. This is our third time in this duplex and we always look forward to coming back. The accommodation offers everything you need, whether it's the view, privacy, right beside the communal pool, or home from home facilities and utensils, where the owners have made various improvements this year. The accommodation is about a 5 minute walk away from the fantastic Playa, although you should be aware this is up an incline but a healthy walk never hurt anyone! An extensive range of restaurants and bars are within a 5-15 minute walk. We love Mojacar and will be back. That is so kind of you to spend the time giving us such a glowing review, we as owners really appreciate it as we do want all our Guests to feel at Home and have as good a holiday as possible. Great to know that you want to come back again next year. Must be doing something right. Lovely, homely property with great views! 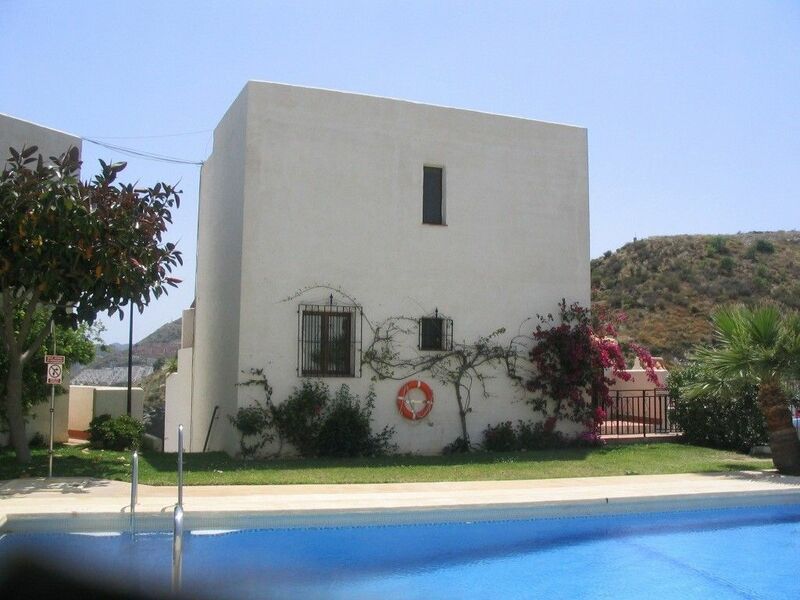 This detached property creates an ideal holiday experience. There is parking right outside and the sea and mountain views from the spacious balcony which has a table and chairs and two good quality loungers, are stunning. If you aren't driving then it is a 10-minute walk up a steep-ish hill so the elderly (and unfit) would need a car or taxi but then you wouldn't get the views. The property is at the Southern end of Mojacar but there's nothing you can't get to and you can drive to Mojacar Pueblo (the old town) in 15 minutes. The WIFI is excellent and there are UK TV channels (freeview) which worked perfectly all the time. The bedrooms are spacious and the kitchen is fully equipped. There are lots of towels available and there is also air-con which I imagine would be needed mid-summer. The pool is very attractive and quiet (we stayed in mid-May) when the water was still pretty cold. If you're coming here you are in for a treat! What can we say your comments have surpassed our expectations and encourages us to try even harder. As long as our Visitor`s have an enjoyable stay and feel at home that is all we can ask for. Hope to see you back at some stage. Yes, have to agree we are up a steep hill so a car is essential. Hence we have the fabulous views we wouldn`t have otherwise. Myself I try to walk up it once a day just to keep fit and burn off some of the calories I tend to put on with all those free Tapas. So pleased that you gave us five stars to proof you had an enjoyable stay. Stayed end of October into November 2017. Second time we have stayed at Pamela's. We had booked via Monarch to Almeria but as we all know that didn't go as planned. We managed to fly to Alicante and had a 2 1/2 hour drive to Mojacar. I was dreading it but the roads were very quiet and it was a stress free journey (as was the return trip). Would highly recommend OK Car Rentals through DoYouSpain. They were faultless. We had brilliant weather. Late 20's every day (Oct/Nov!!). Still plenty of places open to eat and drink. Would normally go to Lanzarote at this time of year but was so glad we returned here. Thanks again Pamela for the use of your villa, it was spot on. Well what can I say except a huge thank you, for your comments and for taking the time to send a review it means a lot to me as an owner to know that we are getting it right. All we want my husband & I is that our guests are made to feel at home and have a relaxing, enjoyable holiday. We wanted a place to relax and this was just perfect. Honestly, we don't have anything negative to say about it. The apartment is very roomy with parking outside the door. The pool area is immaculate and generally quiet. Air con upstairs and downstairs was a life saver. We have never stayed in a better equipped property. If we had our own apartment it would be just like this one. The area itself was fantastic. It seemed very inexpensive compared to other parts of Spain. Want a nice beach? There are miles of them. We are already planning another visit. This is one of those finds that keeps you coming back for more. Highly recommended. What a truly wonderful review you have given us, it is so appreciated. All we want for our visitor`s is for them to feel at home and relax, which is what we ourselves would expect if we were renting an apartment. Great that you were able to make the most of your time in our beautiful Mojacar. Hopefully we will be able to welcome you back someday. Golf: The area boasts four challenging courses.The par 72 Marina de la torre, Europe`s 1st desert course the par 72 Desert Springs. Valle de Este par 71, and the Cortijo Grande a nine hole course set below mountians.All in close proximity.There is also a beautiful new course Playa Macenas, just going out of Mojacar Playa towards Carboneras. Once booked a security deposit of a £100 will be required,which is non-refundable.With the full amount being due 6 weeks prior to commencement of holiday. A further cheque of a £100 to cover any damage or loss to the property and one which would be returned to you or not cashed as the case may be once the property has been inspected.Ofcourse we accept that the odd glass or plate may get broken, but we are not talking about that kind of thing.Only major ones.Hopefully they will never occur. You will not be charged for the Laundry. which is changed on a weekly basis..Any other questions or queries I am sure you will E-Mail me about. Sorry but no all female or all male parties,due to the fact this is a family oreintated complex.